In order to keep nosy paparazzi and garbage-trawlers away from my financial details, I purchased a decent shredder. It makes fine short strips and would possibly thwart even the reassembly skills of Iranian Revolutionaries. But my shredder is mechanized and mindless and has no soul. No élan vital. So I've decided to rend my papers by hand, with the help of the 5-bladed shredding hand scissors available at the retailer MicroCenter. 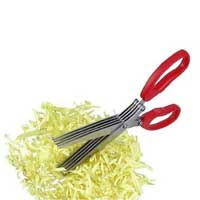 Soon, shredding will once again be an act of personal expression and fulfillment.